Starring Diane Kruger, Denis Moschitto, Johannes Krisch, Ulrich Tukur, Samia Chancrin, Numan Acar, Rafael Santana. 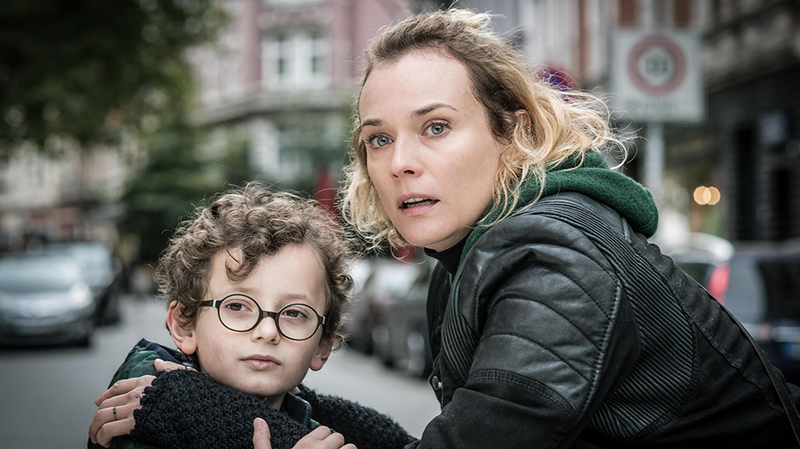 In The Fade observes grief, terrorism and vengeance on a very personal level with a fascinating performance from actress Diane Kruger. The film parcels out information sparingly and gradually making you wonder what twists the narrative will take. However in the end this film turns out not to be a thriller of any sort but a character drama instead. How successfully it navigates this, may be up the individual audience member but Kruger is key to holding your attention and engaging your emotions. The film is split into three parts, The Family, Justice and The Sea, each opening with a home movie about Katja’s (Diane Kruger) family whether it is her wedding day or spending time with her child. Katja is the victim of a terrorist attack that kills her husband (Numan Acar) and son (Rafael Santana) in a bombing that takes place off-screen. The first section is not just about the family she loses but the extended family that rallies around her in the aftermath, while the police investigate and the funerals are arranged. In her grief we slowly see Katja unravel, things happen here that will complicate her path later on but also reveal how important her partner and child were to her. Others fade away and she is utterly alone when a revelation gives her purpose again. Director and co-writer Fatih Akin has made three distinct films here with maybe the first and last one being more emotionally observant and engaging than the middle one. He gets good performances from his cast and frames shots to tell a thousand words. A sobbing mother in her child’s bed in an empty house tells you everything you need to know more than any dialogue could. There are interesting themes here too, an immigrant director telling a story about a terrorist attack from the alt-right and having his alter-ego be a blue eyed blonde haired woman. In a climate of terrorism occurring throughout Europe from both Muslim fanatics and alt-right Fascists the theme about how can a liberal justice system protect or punish against such acts of violence is sure to strike a nerve with all of society. Another theme left to ponder is that once terrorists have taken too much from us, how much fear can they instill and what will happen if we answer back with violence? In The Fade is emotionally honest, asking the audience to pay attention, and there is not a lot of fat in terms of the pacing. Yet the film at times can feel slow, it hints at mysteries that don’t come to pass and in the end the finale feels right but lacks a punch. Maybe because whether we agree or not we can see why that character makes that decision. Conversely to feel that way is a credit to how the cast and crew have made us get inside that character’s head throughout the movie, and for that they should be commended.